In the modern car market, buyers use more than a car’s driving performance to evaluate new cars. Increasingly, modern buyers factor the car’s infotainment system into their purchasing decision; smartphone integration, intuitive media controls and accurate navigation systems are highly desired features. Although you’ve probably read about infotainment systems on new car ads, it can be difficult to evaluate the worth of these systems if you’re not already familiar with them. Research can help you understand the benefits of these systems and identify some of the best systems available for today’s drivers, but it can be tricky to find all the information you want in one place. 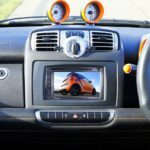 This is why we’ve prepared a handy guide for you, where you can read all the relevant information about infotainment systems, their functionality and various options. An in-vehicle infotainment system is a collection of different devices that are designed to keep the driver and the passengers entertained and informed. Common components of infotainment systems include video screens, video players, audio systems, computers and navigation systems. With the growth of personal electronics, such as smartphones and tablets, consumers have grown accustomed to having ready access to information and entertainment, no matter where they are. Internet connections and sophisticated devices allow infotainment systems to give these drivers the ability to remain connected to the outside world while they drive. Most infotainment systems are controlled by one of the following two methods: knobs or touchscreens. Most early infotainment systems, such as BMW’s iDrive system, use a knob-style control. To control the system, the user flicks and turns the knob in various directions. These early control schemes, though functional, were widely criticized for being complex and unwieldy. However, since the knob-controlled systems were relatively easy to design, several other early adopters, including Mercedes and Audi, used knob-based control schemes as well. Touchscreen systems are becoming increasingly popular. Touchscreen navigation is already familiar to any smartphone user, so drivers are intuitively familiar with the controls for touchscreen-driven systems. Fingertip flicks and taps can easily navigate through touchscreen menus, and drivers can make their selections with a minimum amount of effort and frustration. Land Rover, Porsche, Jaguar, Volkswagen and others have all adopted touchscreen interfaces for their infotainment systems. Although both control schemes are workable, the control scheme is less important than the overall functionality offered by the infotainment system. Navigation systems are one of the key components of any infotainment system. At the most basic level, navigation systems include detailed maps and GPS functionality to give you optimized step-by-step directions to any location. In addition, alternative routing based on real-time traffic data is becoming a standard feature in many factory-installed infotainment systems. One area where many factory systems lag behind, however, is in the destination input selection. Many factory systems only allow you to input the name of your destination, rather than manually inputting the address. This can make it tricky to operate the navigation system, as it’s often easier to type in an address than it is to type in a complete name. In many cases, aftermarket navigation systems offer superior connectivity and traffic monitoring solutions when compared to factory infotainment systems, such as TomTom’s HD Traffic system. Rather than developing their own systems, many automakers have decided to simply offer these third-party systems as a factory option. Most infotainment systems can sync with smartphones and other devices through a Bluetooth connection, allowing you to enjoy your favorite music and apps through your car’s infotainment system. With the push of a button, you can switch from the radio to your device. Even if you have multiple devices, quality infotainment systems allow you to cycle between your devices through the dashboard. In addition, many systems have either an integrated wireless connection or a USB port to connect an external wireless adapter, turning your car into a mobile hotspot. Using an infotainment system can take the driver’s eyes off the road. Between looking at a screen for turn-by-turn directions and attempting to find your favorite song amidst a library of thousands of songs, it’s easy to lose focus for a second and get into an accident. However, some infotainment systems come with advanced display systems to overcome this weakness. Heads-up displays are relatively new additions to today’s infotainment systems. This technology, adapted from the displays used in fighter jets, projects important information directly into the driver’s field of vision. With a heads-up display, the driver can find their favorite song, view turn-by-turn directions, and check their speed without taking their eyes off the road. Some systems will even integrate with your car’s sensors to tell you the speed limit of the road and the distance to the car ahead of you. In the future, automakers hope to make infotainment systems as robust and flexible as smartphones. Many automakers have already developed plans for smartphone-like app stores, allowing drivers to upgrade their systems with a simple software download. Advanced processors, such as the Intel Atom and the NVIDIA Tegra, will give these systems more power. Additionally, new docking systems, such as the dock in VW’s Bulli concept car, will allow drivers of the future to control their infotainment systems through their personal devices, such as an iPad. Control method: Knob control with supplemental buttons and a touchpad for precision inputs. Connectivity: Bluetooth, phone sync, and 3G support. Navigation accuracy: Good. Navigation maps are detailed and smooth, and the 3G connectivity allows the iDrive to obtain detailed traffic information. Connectivity: Bluetooth, phone sync and 3G support. Navigation accuracy: Average. The calculated routes aren’t always the most efficient routes possible. Connectivity: Bluetooth and phone sync. Internet connections are available through a connected phone. Voice control: Yes, though you must be in the correct menu for voice commands to work. Navigation accuracy: Good. Mercedes-Benz uses TomTom’s high-quality navigation and HD Traffic system to provide accurate mapping. Navigation accuracy: Good. Chrysler’s system pairs with Sirius to provide up-to-date maps and real-time traffic information. Control method: Button-based menu navigation. Navigation accuracy: Good. HondaLink integrates its navigation systems with your smartphone to provide excellent navigation services. In addition to these built-in infotainment systems, drivers have many options for aftermarket systems. Apple and Android have both entered the field, offering full-featured systems that use your smartphone as the brain of your infotainment system. Alpine, Pioneer and other major players in the aftermarket auto entertainment industry also offer a number of different infotainment systems. With all the options available in the aftermarket, you can find systems with a wide selection of different connectivity options, control schemes and other features. Have you added an infotainment system to your car yet? What do you think about these systems? What are your favorite features of these new systems?